Apollo Health And Beauty Care Inc. Proprietary Name: Giant Eagle Spring Fresh Mouthwash What is the Proprietary Name? Non-Proprietary Name: Eucalyptol, Menthol, Methyl Salicylate, Thymol What is the Non-Proprietary Name? 63148 - Apollo Health And Beauty Care Inc. 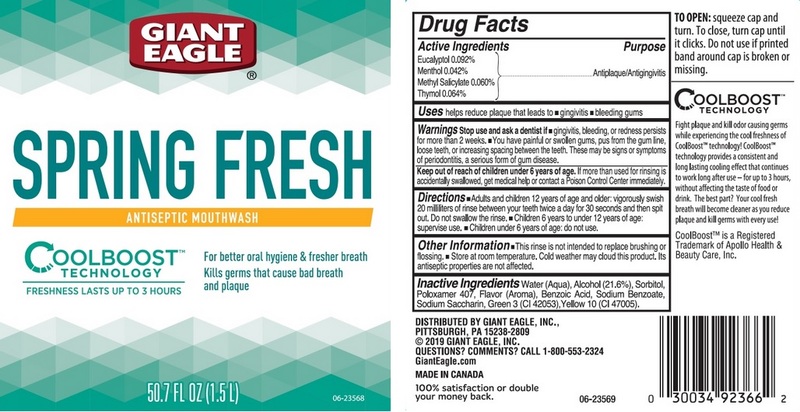 Giant Eagle Spring Fresh Mouthwash with NDC 63148-570 is a a human over the counter drug product labeled by Apollo Health And Beauty Care Inc.. The generic name of Giant Eagle Spring Fresh Mouthwash is eucalyptol, menthol, methyl salicylate, thymol. The product's dosage form is liquid and is administered via oral form. Labeler Name: Apollo Health And Beauty Care Inc.
Stop use and ask a dentist ifgingivitis, bleeding, or redness persists for more than 2 weeks.you have painful or swollen gums, pus from the gum line, loose teeth, or increasing spacing between the teeth. Thes may be signs or symptoms of periodontitis, a serious form of gum disease. If more than used for rinsing is accidentally swallowed, get medical help or contact a Poison Control Center immediately. Adults and children 12 years of age and older: vigorously swish 20 milliliters of rinse between your teeth twice a day for 30 seconds and then spit out. Do not swallow the rinse. Children 6 years to under 12 years of age: supervise use.Children under 6 years of age: do not use. This rinse is not intended to replace brushing or flossingStore at room temperature. Cold weather may cloud this product. Its antiseptic properties are not affected. Water (Aqua), Alcohol (21.6%), Sorbitol, Poloxamer 407, Flavor (Aroma), Benzoic Acid, Sodium Benzoate, Sodium Saccharin, Green 3 (CI 42053), Yellow 10 (CI 47005).